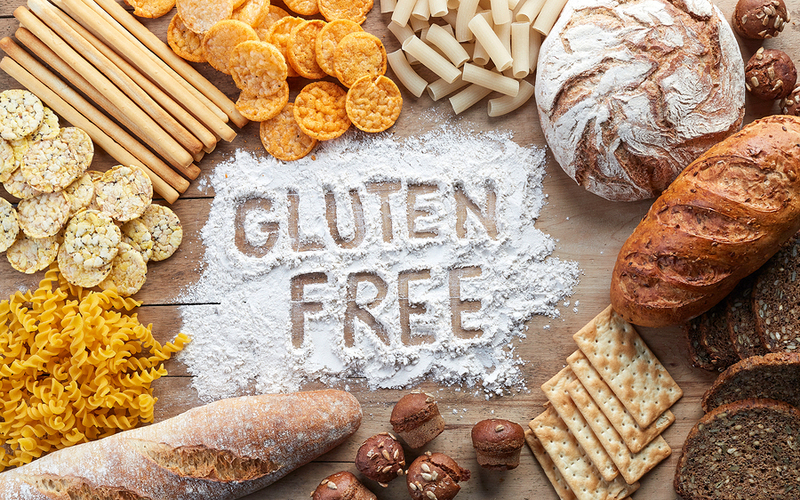 Over the past several years, the gluten-free diet has become quite popular thanks to its effectiveness in resolving gastrointestinal issues. What a lot of people don’t realize is the effect it can have on the brain and nervous system. Eliminating this one ingredient from your diet could possibly change your life for the better. Gluten is a protein found in wheat, barley, rye, and other grains. It is the protein that helps hold food together, makes dough elastic and gives bread its chewy texture. Gluten sensitivity is a condition that causes a person to react after ingesting gluten. Symptoms include digestive issues such as gas, bloating, diarrhea and constipation, as well as fatigue, brain fog, joint and muscle aches, depression, anxiety, skin problems, migraines, dental issues, hormone imbalance and weight gain. Celiac disease is a genetic autoimmune disorder where eating gluten damages the small intestine. The nutrients cannot be absorbed properly into the body and it causes malnourishment. Symptoms include fatigue, anemia, bone and joint pain, arthritis, osteoporosis, depression, anxiety, tingling or numbness in hands and feet, seizures, migraines, missed periods, infertility, itchy skin rash, liver and biliary tract disorders, and canker sores in the mouth. It can even lead to the start of neurological diseases, or certain cancers. For people with celiac disease, a gluten-free diet is a must. Always read labels. If something is fried or coated, crispy or crusted, that could indicate that it was coated with breading or gluten-containing flour. Ingesting wheat means you have unknowingly ingested the most common dietary mind-active food known today. Gluten can influence behavior and mood, and can cause euphoria, addictive behavior and appetite stimulation. For some people, wheat affects them like a drug because it can yield drug-like neurological effects. 1. Ataxia – The best-characterized neurologic complication related to gluten sensitivity is ataxia, a lack of muscle control or coordination of voluntary movements, such as walking or picking up objects. Ataxia can affect various movements, creating difficulties with speech, eye movement and swallowing. 3. Anxiety Disorders – Various types of anxiety are associated with gluten intolerance. One study found that celiac disease patients were significantly more likely to have anxiety when compared to controls, and that after one year on a gluten-free diet, there was a significant improvement in anxiety symptoms. Other anxiety disorders such as social phobia and panic disorder have been linked to gluten. It was reported that a significantly higher proportion of celiac disease patients had social phobia compared to normal controls. Additionally, a higher lifetime prevalence of panic disorder has been found in celiac disease patients with new studies confirming the increased association between celiac disease and anxiety. 4. Depression and Mood Disorders – Depression and related mood disorders are reported to be associated with gluten sensitivity and celiac disease. One study found that major depressive disorder and dysthymic disorder (a continuous long-term, chronic form of depression) were more common in a group of celiac disease patients compared to controls. Another study found that celiac patients were more likely to be diagnosed with subsequent depression as compared to people without the disease. Research found that an elderly population with gluten sensitivity was more than twice as likely to have depression when compared to the elderly sample without gluten sensitivity. Research has described improvement in depressive symptoms following a gluten-free diet. 5. Attention Deficit-Hyperactivity Disorder (ADHD) – A few studies have suggested that ADHD may be associated with gluten intolerance, as well. A study measured ADHD symptoms in celiac disease patients and found that these symptoms are more common in them as compared to the general population. A six month gluten-free diet was reported to improve ADHD symptoms and the majority of patients (74%) in this report wanted to continue the gluten-free diet due to significant relief of their symptoms. 6. Autism Spectrum Disorders – Autism spectrum disorders (ASD) have been associated with gluten intolerance. Studies have shown the relationship between ASD and autoimmune disease, specifically celiac disease. One study found an increased risk of ASDs in children with a maternal history of rheumatoid arthritis and celiac disease. When compared to controls, persons with ASDs and their family members have been found to have leaky gut syndrome, and when treated with a gluten- and casein-free diet, have been able to a improve leaky gut when compared to patients on an unrestricted diet. This has been supported by other studies. 7. Schizophrenia – Schizophrenia may be the psychiatric disorder with the most robust relationship to gluten. As early as 1953, it was noted that children with schizophrenia were prone to having celiac disease. A research study published in 1966 showed that the prevalence of schizophrenia was lower in areas of lower grain consumption. It also showed that a milk- and cereal-free diet improved schizophrenic symptoms. A similar study showed that these patients were discharged twice as quickly as those not on the diet and a third showed that recovery is disturbed when gluten is added to a previously gluten-free diet. Wheat protein was shown to cause reactions such as seizures and other unusual behaviors, and this may be related to the development of schizophrenia. Other neurological displays of gluten sensitivity and celiac disease include peripheral neuropathy (damaged nerves), inflammatory myopathies (muscle disease), myelopathies (disease of spinal cord), headache, and gluten encephalopathy (abnormal brain function). White matter abnormalities associated with gluten sensitivity have also been reported. The only treatment for gluten sensitivity and celiac disease is a gluten-free diet, which excludes all grain products, specifically wheat, barley, rye and cross-contaminated oats. Today there are many gluten-free food options available in the grocery stores to help make going gluten-free much easier. Did you know that hormone decline and imbalance can also cause symptoms such as brain fog, depression, moodiness and anxiety, to name a few? Take our symptom checker quiz to find out if you have symptoms of hormone decline. Wheat Belly, by William Davis, M.D.